Cleansers are used in the nail industry to remove oils and moisture from the nail plate prior to product application. The cleanser temporarily dehydrates the nail plate so it is better able to adhere to the product about to be applied, thus helping prevent service breakdown. 1. Isopropyl Alcohol: The main component in cleansers, isopropyl alcohol, is a clear and flammable liquid derived from propene and water. Isopropyl alcohol is a common household ingredient often used for cleaning and disinfection, and most often referred to as rubbing alcohol. Isopropyl alcohol helps to rid the nail plate of bacteria and fungal spores that might be there. Isopropyl alcohol has a quick evaporation rate and because it is a solvent it quickly absorbs and removes moisture from the skin and nail beds. It is produced industrially using a process called hydration, where water and propene are chemically bound together to create isopropyl alcohol. It is used in the transportation industry as a fuel additive to help keep water from separating from the actual fuel and potentially freezing in colder temperatures and causing engine problems. The isopropyl alcohol helps keep the water soluble in the gasoline, where it is less damaging to the engine. It also is a common ingredient in windshield de-icing products. 2. 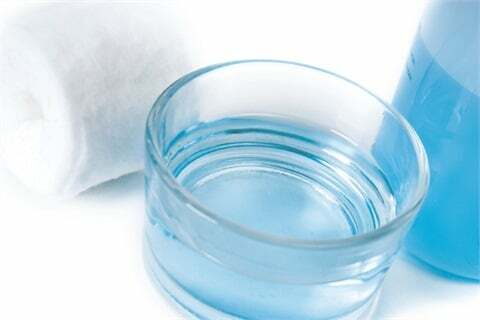 Acetone: Used sometimes in cleansers but at lower concentrations, acetone aids in removing surface oils and other contaminants from the nail plate, leaving the nail bed dry and ready for product application. 3. Butyl Acetate and Ethyl Acetate: These are common solvents used to help keep all the ingredients together in a liquid form prior to use. Check out the “cleanser” entry on NAILS Encyclopedia, www.nailsmag.com/encyclopedia, for more articles on everything you’d want to know about cleansers.